Real's fibreglass gratings are - as the only ones on the market that are certified (fire and smoke development) and produced in the EU. For safety's sake. 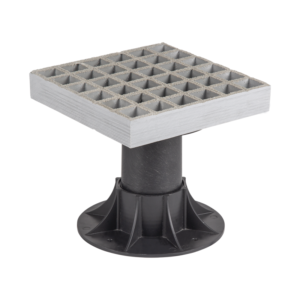 Fibre gratings are as strong as conventional steel grates and are now available with an efficient non-slip surface that gives you a really good reason to consider replacing your steel grates with fibre gratings. 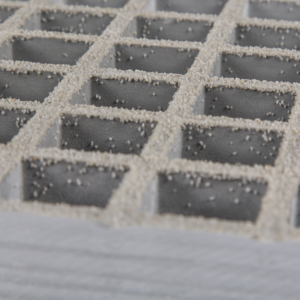 The fibre gratings' properties make them an ideal alternative to conventional steel grates. Anti-slip fibre gratings are safe even if they are wet from water, oil or the like. They are also an optimal solution as a working platform or landing fibre grating, since they are both non-slip and spring at the same time. This makes them extremely comfortable to work and stand on. The fibre gratings are very flexible and can be easily adapted to the surroundings. We provide fibre gratings either in whole sheets or cut to size. 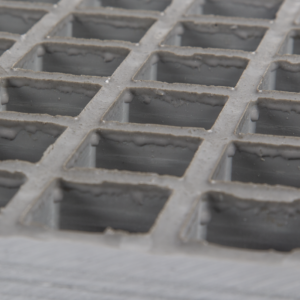 The anti-slip surface on our fibre gratings is made of hardened stone fragments. These stone fragments are cast into the natural concave surface of the grate and provide optimum friction in areas exposed to oil, water, grease, algae, ice, leaf fall and so on. The fact that the stones are in a concave curvature means that the fuse is permanent, even if the surface is exposed to hard wear. The stone fragments therefore ensure that our fibreglass gratings are non-slip in all weather conditions and in all types of environments. As a working platform or landing is a fiber grating an ideal solution for several reasons. Landings are often places you step up to to perform a task of short or long duration. Therefore, the flexibility of the fibre gratings is a major ergonomic advantage, while it is 100 percent anti slip. In addition, the fibre gratings can be ordered with a yellow 'nose' in order to optimize their visual safety. 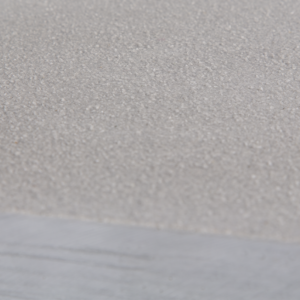 The fibreglass gratings are available with both open and closed surfaces. Our fibre gratings have many advantages. They are characterised with, among other things, that they are extremely lightweight, which makes it easier to mount them. Even though our fibreglass gratings are extremely lightweight, it does not mean that they are fragile. On the contrary. They are highly resistant and durable. Fiber gratings can be mounted in several different locations. The most obvious places to mount the fibre gratings are stairs, walkways, landings, ship decks, bridges, production lines, laundry halls, chemical rooms, helidecks and other places where traditionally galvanized steel grates have been used. Fibreglass as a material has a number of properties that make it extremely attractive. It is, for example, resistant to many chemicals, both acids and bases. In addition, the material is fire-resistant and self-extinguishing. This has also made it possible for our fibre gratings - as the only ones in the world - to have become IMO certified. This rigorous certification makes them approved for use on ships where fire criteria are very tough. Safety-wise, the fibreglass by itself of course also contributes to preventing slip and fall accidents, as it is permanently anti-slip. In case you need gratings, we recommend fibre gratings, as these can prevent trips and falls. Most of us have tried walking on a steel grating or similar after it has rained. Even when the steel gratings are made with a form of anti-slip, they will be slippery when wet - and after a short wear these 'peaks' will also be worn round and then we are back to where we started from. Therefore, the risk of slipping and falling on a fibre grating is significantly less than on a steel grating. Even though it has rained! There are not many who know more about anti-slip products than us. Our knowledge of fibreglass is both large and broad, and is rooted in many years of experience from both the offshore and marine industries. If you need guidance on fibre gratings, you are very welcome to contact us either by mail or telephone. We can be contacted both by +45 26 11 44 66 and realsap@realsap.com. We are a flexible manufacturer that is more than happy to fulfill special wishes and needs. Therefore, do not hesitate to contact us, even if you may have special challenges. We can without a doubt help you with the solution you are looking for.